David is a gay man who just broke up with his boyfriend and is hitting something of a mid-life crisis. Part of that involves becoming more aware of his voice, specifically how “gay” he sounds. “Why do all gay people talk like braying ninnies,” he asks, not without a little bit of self-loathing? 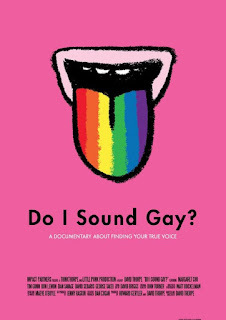 So he sets out to find answers, and to document his efforts in the documentary film DO I SOUND GAY? Not only does David want to find out why he sounds the way he does, he wants to change it. A couple of highly regarded speech therapists offer some suggestions, and David makes some progress, but is changing his voice to sound more “masculine” really the right thing to do? Aside from documenting his personal efforts to change, David also interviews friends, family, and a few prominent gay celebrities like George Takei, Tim Gunn, Dan Savage, and Margaret Cho. Cultural attitudes towards gay speech both past and present are explored, and some convincing theories as to why “gay” speech sounds the way it does for some, while other gay men sound “straight” and some straight men sound “gay’ are eventually offered. Ultimately, though, the main thrust is David’s personal journey towards self acceptance and confidence, and it’s an entertaining and oft times informative trip. 3 out of 4 stars.